The birds forage the yard, the frogs are singing their midnight tune, and the turkeys are gobbling as the rising sun stretches across the dew-covered grass. Spring has arrived in Virginia, welcoming various activities for the outdoors. The shad are running and the trout are being stocked, which means it’s time to dust off the tackle box and purchase a fishing license. Virginia is one of the most unique states to fish because of the diversity of water bodies and species that exist from the Chesapeake Bay to Clear Creek in the Southwest. There are endless opportunities to fish statewide for numerous species because of the consistent work of VDGIF biologists, who are dedicated to thriving fish and maximizing an angler’s success on the water. VDGIF has created programs that offer opportunities for memorable experiences on the water for new or seasoned anglers. Trout Heritage Day is the initial day of trout season. This year, Heritage Day is April 7. Twenty bodies of water across the state will be stocked for anglers to cast a line on Heritage Day. This allows anglers to know ahead of time what waters will be fresh for fishing so they can plan the weekend in advance. Looming from Heritage Day, the pre-announced trout stocking schedule was designed to give anglers the privilege of knowing what waters are expected to be stocked throughout the season, so anglers can plan trips around the scheduled trout stockings. Grab the fly’s, and maybe a tent and a skillet, because it’s hard to compare the taste of fresh-fried trout over a campfire. See the state forest website for information about camping opportunities that might be near your desired fishing location. Virginia also offers a Youth-Only Trout Stocking Program. 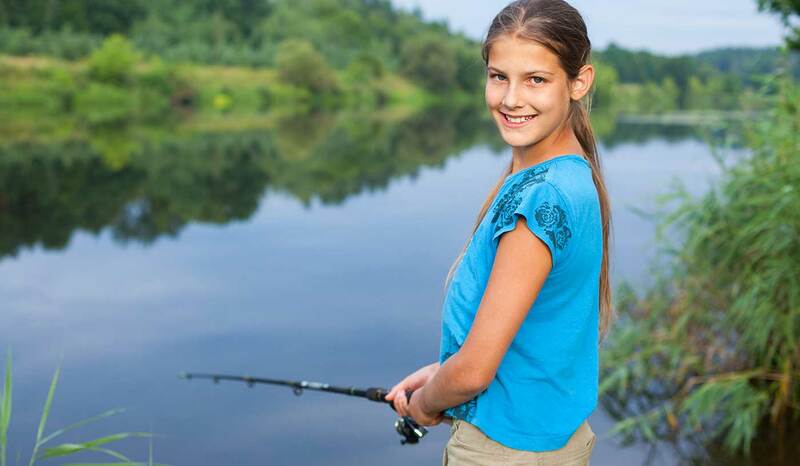 This program gives youth ages 15 and under the leisure of fishing designated bodies of water in Virginia from April 1 to June 15. This is a great opportunity for parents to take their children fishing in locations with no interference from other avid anglers. Virginia doesn’t only specialize in trout management and fishing. The Commonwealth inhabits and maintains multitudes of fish that appeal to all anglers. Don’t forget about Free Fishing Days June 1st to 3rd this year. Take advantage of fishing and boating without purchasing your license. If you don’t believe what Virginia offers, Free Fishing Day is a great opportunity to experience the stellar statewide fishing before buying a license. “If you have a life list of species of fish you want to catch, you can catch a lot of them here in Virginia,” says VDGIF Fish Passage Coordinator Alan Weaver. As a Mid-Atlantic state, Virginia offers saltwater, cold water, lakes, fish runs, and pristine mountain streams, providing recreational fishing diversity that appeals to anglers of all types. Whether you are fishing bass, trout, herring, striper, musky, walleye, catfish, or another desired species, you are certain to be successful on the water and contribute to the conservation efforts of VDGIF. Buy your license now — it helps your favorite fish to thrive in clean water for continual success of angling each year!